I-It relationships come in two varieties. Some are strictly utilitarian. You’re exchanging information in order to do some practical thing, like getting your taxes done. But other I-It relationships are truncated versions of what should be deep relationships. You’re with a friend, colleague, spouse or neighbor, but you’re not really bringing your whole self to that encounter. You’re fearful, closed or withdrawn — objectifying her, talking at her, offering only a shallow piece of yourself and seeing only the shallow piece of her. In our culture we use phrases like finding oneself, finding your passion, loving yourself so you can love others. But Buber argued that it’s nonsensical to think of the self in isolation. The I only exists in relation to some other. Buber described genuine dialogue as a sort of social flow. Teachers and students are learning with each other. An audience and an artist are lost in a performance. These moments don’t last. It is the “exalted melancholy of our fate” that Thou moments always fade back into It moments. But a world has been built during such intense moments. A binding cord has been strengthened. The person who has experienced the Thou has been thickened and comes closer to wholeness. Seed questions for reflection: How do you relate to the distinction between I-It and I-Thou moments? Can you share a personal story of an I-Thou moment in your life? What helps you become aware of whether you are in an I-Thou moment or an I-It moment? This rings so true.... and it adds to my learning of last week when reading What makes you NOT a Buddhist - by Dzongasar Jamyang Khyentse. First one is written as "All compounded / fabricated things are impermanent. "Compounded//fabricated" meaning anything that arises when two things, persons, thoughts, actions, meet. So also in relationships. And before that : everything is emptiness. I-Thou moments would correspond to the present moments there is nothing coming between and there is 100% empathy and understanding between souls. The day-to-day experiences of people : quick jumping to analysis, categorizing and boxing of judgments is indeed an I-IT phenomenon. It was an OMG moment for me when I read this... because in such moments essentially we destroy human-ness of "others" into item-ness most of the time without awareness. Thank you for this --- to watch out for. What came to mind whilst reading this piece were the hours immediately following my daughter's birth. I felt such intensity of connectedness with her. In fact saying I 'felt' it isn't the word. I 'was' it! It lasted for several hours at a high level of awareness and extreme intensity and joy which expanded to include everyone and everything that had ever existed. I have experienced this feeling at other times but for much shorter periods. Thank you for this insight as now (41 years later) our relationship is struggling and we are considering attending relationship counselling to help heal a rift that has sat between us for over 4 years. Not easy as she lives in Australia and I live in UK. I shall take the I-Thou insight with me. Life is a web of relationships. Some are I-It relationships. They are utilitarian,pragmatic and self-serving. Such relationships are shallow leaving no nourishing deep roots of memory in our mind. I have had such relationships leaving no worth- remembering deep traces behind. I cherish I-Thou relationships. It is a relationship between two genuine and deeply caring beings. It has openness, trust, and compassion. I have been blessed to have such deep relationships with my parents, family members, a few friends and my soul mate. Such relationships have made me a whole and wholesome person. Such relationships have been blessings to me and I am deeply grateful for such blessings. May we keep our mind and heart open to cultivate such I-Thou relationships! I-it moments are utilitarian, goal- and future-directed. I-thou moments are purposeless or goal-less and present. Both kinds of moments are part of life. In I-thou moments there are two individuals meeting, being open and honest in the moment. 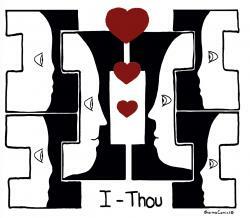 In I-thou moments the individuals are personally present and vulnerable, simply being together. In I-it moments there is an agenda, some thing or some function is being sought, and I relate to the other as being there to serve a purpose. I-it moments can be fine when the agenda is out in the open, and are a problem when there is a hidden agenda. I've had some I-thou moments in which I and another are being soul to soul in a spiritual agape love, and such moments are precious and few, as Sonny Geraci sang. I-it and I-thou moments are easy to tell apart. When I'm out to get something from the other I'm in an I-it moment. When I'm simply meeting and being met, being open in the present and without purpose or agenda, I'm in an I-thou moment.